Liczba stron: 314 Jest to ujednolicona liczba stron, która ułatwi Ci porównanie długości książek. Każda strona Legimi to 200 słów. Otto is a prince of a small German court of the eighteenth century, his indolent character leads him to delegate all power to his wife Amélie-Séraphine, which in turn is influenced by the Prime Minister Baron Gondremark. The war of invasion to the near duchy of Gerolstein, will be the beginning of the end for the three. Thank you for choosing to read one of ours books. At last, after so many years, I have the pleasure of re-introducing you to ‘Prince Otto,’ whom you will remember a very little fellow, no bigger in fact than a few sheets of memoranda written for me by your kind hand. The sight of his name will carry you back to an old wooden house embowered in creepers; a house that was far gone in the respectable stages of antiquity and seemed indissoluble from the green garden in which it stood, and that yet was a sea-traveller in its younger days, and had come round the Horn piecemeal in the belly of a ship, and might have heard the seamen stamping and shouting and the note of the boatswain’s whistle. It will recall to you the nondescript inhabitants now so widely scattered:—the two horses, the dog, and the four cats, some of them still looking in your face as you read these lines;—the poor lady, so unfortunately married to an author;—the China boy, by this time, perhaps, baiting his line by the banks of a river in the Flowery Land;—and in particular the Scot who was then sick apparently unto death, and whom you did so much to cheer and keep in good behaviour. You may remember that he was full of ambitions and designs: so soon as he had his health again completely, you may remember the fortune he was to earn, the journeys he was to go upon, the delights he was to enjoy and confer, and (among other matters) the masterpiece he was to make of ‘Prince Otto’! Well, we will not give in that we are finally beaten. We read together in those days the story of Braddock, and how, as he was carried dying from the scene of his defeat, he promised himself to do better another time: a story that will always touch a brave heart, and a dying speech worthy of a more fortunate commander. I try to be of Braddock’s mind. I still mean to get my health again; I still purpose, by hook or crook, this book or the next, to launch a masterpiece; and I still intend—somehow, some time or other—to see your face and to hold your hand. Meanwhile, this little paper traveller goes forth instead, crosses the great seas and the long plains and the dark mountains, and comes at last to your door in Monterey, charged with tender greetings. Pray you, take him in. He comes from a house where (even as in your own) there are gathered together some of the waifs of our company at Oakland: a house—for all its outlandish Gaelic name and distant station—where you are well-beloved. You shall seek in vain upon the map of Europe for the bygone state of Grünewald. An independent principality, an infinitesimal member of the German Empire, she played, for several centuries, her part in the discord of Europe; and, at last, in the ripeness of time and at the spiriting of several bald diplomatists, vanished like a morning ghost. Less fortunate than Poland, she left not a regret behind her; and the very memory of her boundaries has faded. It was a patch of hilly country covered with thick wood. Many streams took their beginning in the glens of Grünewald, turning mills for the inhabitants. There was one town, Mittwalden, and many brown, wooden hamlets, climbing roof above roof, along the steep bottom of dells, and communicating by covered bridges over the larger of the torrents. The hum of watermills, the splash of running water, the clean odour of pine sawdust, the sound and smell of the pleasant wind among the innumerable army of the mountain pines, the dropping fire of huntsmen, the dull stroke of the wood-axe, intolerable roads, fresh trout for supper in the clean bare chamber of an inn, and the song of birds and the music of the village-bells—these were the recollections of the Grünewald tourist. North and east the foothills of Grünewald sank with varying profile into a vast plain. On these sides many small states bordered with the principality, Gerolstein, an extinct grand duchy, among the number. On the south it marched with the comparatively powerful kingdom of Seaboard Bohemia, celebrated for its flowers and mountain bears, and inhabited by a people of singular simplicity and tenderness of heart. Several intermarriages had, in the course of centuries, united the crowned families of Grünewald and Maritime Bohemia; and the last Prince of Grünewald, whose history I purpose to relate, drew his descent through Perdita, the only daughter of King Florizel the First of Bohemia. That these intermarriages had in some degree mitigated the rough, manly stock of the first Grünewalds, was an opinion widely held within the borders of the principality. The charcoal burner, the mountain sawyer, the wielder of the broad axe among the congregated pines of Grünewald, proud of their hard hands, proud of their shrewd ignorance and almost savage lore, looked with an unfeigned contempt on the soft character and manners of the sovereign race. The precise year of grace in which this tale begins shall be left to the conjecture of the reader. But for the season of the year (which, in such a story, is the more important of the two) it was already so far forward in the spring, that when mountain people heard horns echoing all day about the north-west corner of the principality, they told themselves that Prince Otto and his hunt were up and out for the last time till the return of autumn. At this point the borders of Grünewald descend somewhat steeply, here and there breaking into crags; and this shaggy and trackless country stands in a bold contrast to the cultivated plain below. It was traversed at that period by two roads alone; one, the imperial highway, bound to Brandenau in Gerolstein, descended the slope obliquely and by the easiest gradients. The other ran like a fillet across the very forehead of the hills, dipping into savage gorges, and wetted by the spray of tiny waterfalls. Once it passed beside a certain tower or castle, built sheer upon the margin of a formidable cliff, and commanding a vast prospect of the skirts of Grünewald and the busy plains of Gerolstein. The Felsenburg (so this tower was called) served now as a prison, now as a hunting-seat; and for all it stood so lonesome to the naked eye, with the aid of a good glass the burghers of Brandenau could count its windows from the lime-tree terrace where they walked at night. In the wedge of forest hillside enclosed between the roads, the horns continued all day long to scatter tumult; and at length, as the sun began to draw near to the horizon of the plain, a rousing triumph announced the slaughter of the quarry. The first and second huntsman had drawn somewhat aside, and from the summit of a knoll gazed down before them on the drooping shoulders of the hill and across the expanse of plain. They covered their eyes, for the sun was in their faces. The glory of its going down was somewhat pale. Through the confused tracery of many thousands of naked poplars, the smoke of so many houses, and the evening steam ascending from the fields, the sails of a windmill on a gentle eminence moved very conspicuously, like a donkey’s ears. And hard by, like an open gash, the imperial high-road ran straight sun-ward, an artery of travel. There is one of nature’s spiritual ditties, that has not yet been set to words or human music: ‘The Invitation to the Road’; an air continually sounding in the ears of gipsies, and to whose inspiration our nomadic fathers journeyed all their days. The hour, the season, and the scene, all were in delicate accordance. The air was full of birds of passage, steering westward and northward over Grünewald, an army of specks to the up-looking eye. And below, the great practicable road was bound for the same quarter. But to the two horsemen on the knoll this spiritual ditty was unheard. They were, indeed, in some concern of mind, scanning every fold of the subjacent forest, and betraying both anger and dismay in their impatient gestures. ‘Mayhap, he’s gone home,’ said Kuno, but without conviction. ‘He’s not my Otto,’ growled Kuno. ‘Then I don’t know whose he is,’ was the retort. ‘You would put your hand in the fire for him to-morrow,’ said Kuno, facing round. ‘You have him on the brain,’ retorted his companion. ‘There he goes!’ he cried, the next moment. And sure enough, about a mile down the mountain, a rider on a white horse was seen to flit rapidly across a heathy open and vanish among the trees on the farther side. ‘Well, if he founders that mare, I’ll never forgive him,’ added the other, gathering his reins. And as they turned down from the knoll to rejoin their comrades, the sun dipped and disappeared, and the woods fell instantly into the gravity and greyness of the early night. The night fell upon the Prince while he was threading green tracks in the lower valleys of the wood; and though the stars came out overhead and displayed the interminable order of the pine-tree pyramids, regular and dark like cypresses, their light was of small service to a traveller in such lonely paths, and from thenceforth he rode at random. The austere face of nature, the uncertain issue of his course, the open sky and the free air, delighted him like wine; and the hoarse chafing of a river on his left sounded in his ears agreeably. It was past eight at night before his toil was rewarded and he issued at last out of the forest on the firm white high-road. It lay downhill before him, with a sweeping eastward trend, faintly bright between the thickets; and Otto paused and gazed upon it. So it ran, league after league, still joining others, to the farthest ends of Europe, there skirting the sea-surge, here gleaming in the lights of cities; and the innumerable army of tramps and travellers moved upon it in all lands as by a common impulse, and were now in all places drawing near to the inn door and the night’s rest. The pictures swarmed and vanished in his brain; a surge of temptation, a beat of all his blood, went over him, to set spur to the mare and to go on into the unknown for ever. And then it passed away; hunger and fatigue, and that habit of middling actions which we call common sense, resumed their empire; and in that changed mood his eye lighted upon two bright windows on his left hand, between the road and river. He turned off by a by-road, and in a few minutes he was knocking with his whip on the door of a large farmhouse, and a chorus of dogs from the farmyard were making angry answer. A very tall, old, white-headed man came, shading a candle, at the summons. He had been of great strength in his time, and of a handsome countenance; but now he was fallen away, his teeth were quite gone, and his voice when he spoke was broken and falsetto. ‘Amen. And I most heartily thank you,’ replied Otto, bowing in his turn. Otto entered a chamber occupying the greater part of the ground-floor of the building. It had probably once been divided; for the farther end was raised by a long step above the nearer, and the blazing fire and the white supper-table seemed to stand upon a daïs. All around were dark, brass-mounted cabinets and cupboards; dark shelves carrying ancient country crockery; guns and antlers and broadside ballads on the wall; a tall old clock with roses on the dial; and down in one corner the comfortable promise of a wine barrel. It was homely, elegant, and quaint. A powerful youth hurried out to attend on the grey mare; and when Mr. Killian Gottesheim had presented him to his daughter Ottilia, Otto followed to the stable as became, not perhaps the Prince, but the good horseman. When he returned, a smoking omelette and some slices of home-cured ham were waiting him; these were followed by a ragout and a cheese; and it was not until his guest had entirely satisfied his hunger, and the whole party drew about the fire over the wine jug, that Killian Gottesheim’s elaborate courtesy permitted him to address a question to the Prince. ‘You have perhaps ridden far, sir?’ he inquired. ‘Possibly, sir, from the direction of Brandenau?’ continued Killian. ‘Precisely: and I should have slept to-night, had I not wandered, in Mittwalden,’ answered the Prince, weaving in a patch of truth, according to the habit of all liars. ‘Business leads you to Mittwalden?’ was the next question. 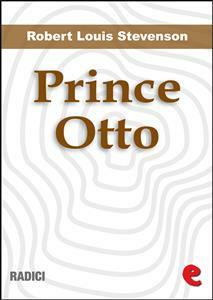 ‘I suppose you see nothing of the Prince?’ inquired Otto. ‘Why so? is he so much disliked?’ asked Otto. ‘Indeed,’ said the Prince, somewhat faintly. ‘And bald, too,’ added Fritz. Otto passed his hand among his locks. At that moment he was far from happy, and even the tedious evenings at Mittwalden Palace began to smile upon him by comparison. ‘Ah, well, the Prince is married,’ cried Fritz, with a coarse burst of laughter. ‘That seems to entertain you, sir,’ said Otto. ‘Ay,’ said the young boor. ‘Did you not know that? I thought all Europe knew it!’ And he added a pantomime of a nature to explain his accusation to the dullest. ‘He has broke his oath; then he is a perjurer. He takes the money and leaves the work; why, then plainly he’s a thief. A cuckold he was before, and a fool by birth. Better me that!’ cried Fritz, and snapped his fingers. And the old man, with the twentieth courteous inclination, left his guest alone. The Prince was early abroad: in the time of the first chorus of birds, of the pure and quiet air, of the slanting sunlight and the mile-long shadows. To one who had passed a miserable night, the freshness of that hour was tonic and reviving; to steal a march upon his slumbering fellows, to be the Adam of the coming day, composed and fortified his spirits; and the Prince, breathing deep and pausing as he went, walked in the wet fields beside his shadow, and was glad. A trellised path led down into the valley of the brook, and he turned to follow it. The stream was a break-neck, boiling Highland river. Hard by the farm, it leaped a little precipice in a thick grey-mare’s tail of twisted filaments, and then lay and worked and bubbled in a lynn. Into the middle of this quaking pool a rock protruded, shelving to a cape; and thither Otto scrambled and sat down to ponder. Soon the sun struck through the screen of branches and thin early leaves that made a hanging bower above the fall; and the golden lights and flitting shadows fell upon and marbled the surface of that so seething pot; and rays plunged deep among the turning waters; and a spark, as bright as a diamond, lit upon the swaying eddy. It began to grow warm where Otto lingered, warm and heady; the lights swam, weaving their maze across the shaken pool; on the impending rock, reflections danced like butterflies; and the air was fanned by the waterfall as by a swinging curtain. Otto, who was weary with tossing and beset with horrid phantoms of remorse and jealousy, instantly fell dead in love with that sun-chequered, echoing corner. Holding his feet, he stared out of a drowsy trance, wondering, admiring, musing, losing his way among uncertain thoughts. There is nothing that so apes the external bearing of free will as that unconscious bustle, obscurely following liquid laws, with which a river contends among obstructions. It seems the very play of man and destiny, and as Otto pored on these recurrent changes, he grew, by equal steps, the sleepier and the more profound. Eddy and Prince were alike jostled in their purpose, alike anchored by intangible influences in one corner of the world. Eddy and Prince were alike useless, starkly useless, in the cosmology of men. Eddy and Prince—Prince and Eddy. It is probable he had been some while asleep when a voice recalled him from oblivion. ‘Sir,’ it was saying; and looking round, he saw Mr. Killian’s daughter, terrified by her boldness and making bashful signals from the shore. She was a plain, honest lass, healthy and happy and good, and with that sort of beauty that comes of happiness and health. But her confusion lent her for the moment an additional charm.